Guns don’t kill people, children do. Cassie Culpepper, age 11, was riding in the back of a pickup when her 12-year-old brother pointed his father’s pistol at her. He believed he had removed the bullets, and so jokingly pulled the trigger. He was wrong. Since January 1st, 2013 there have been 11 reported gun fatalities involving preschool children as the shooter. Ten more toddlers have accidentally shot themselves or somebody else this year. And this statistic represents only data for which a toddler is the shooter in a death (MotherJones reports that 71 children have been killed by guns since Newtown). The BBC originally reported on this phenomenon in 2009 when, in the span of 24 hours, two children were shot by their toddler siblings. In both cases, the deaths were a result of improperly secured weapons. A New York Times’ piece added to the controversy showing that, due to idiosyncrasies over what constitutes a ‘homicide’ or an ‘accident’, child firearm accidental killings happen roughly twice as much as they are reported in national databases. These deaths, quite obviously, could have been avoided had any adult, at any point in time, exercised even a modicum of discretion concerning the availability of their firearm. Our outrage towards these deaths should be proportional to how senseless they are, how utterly avoidable they were. We put child-locks on our medicine cabinets, secure our pools with gates, put on helmets during bike rides, and we give our 12-year-old boys a rifle to play with in the backseat of a truck. Wouldn’t want him to get bored. After all, the only way to stop a bad child with a gun is a good child with a gun. In April 1987 seven-year-old Michelle Snow was killed in Riverside, California by a stray lawn dart that was thrown by her brother’s playmate. These darts were part of a children’s game in the 70’s and 80’s involving large, weighted darts with sharp metal tips, designed to pierce a horizontal target on the ground. Michelle’s father immediately began a campaign to ban the darts, arguing that anything less than a full-scale ban would be insufficient—after all, even if you were to ban lawn darts in your own home, nothing can stop a neighbor’s child from throwing one over the fence. The campaign led to an all-out ban in the US and Canada. To this day, it is illegal to assemble a lawn dart in either of the two countries. The problem wasn’t just that lawn darts were dangerous, it was that they were dangerous AND they were being marketed to children as a game, despite being responsible for 6,100 emergency room visits over a span of eight years. So when parents observed that these unnecessarily dangerous toys were injuring and killing their children, they did what any sensible parent would do: they complained until the government listened. So here are six reasons, supported in the academic literature, for why guns do, in fact, kill people. One area over which there is very little controversy involves the relationship between gun ownership and suicide rates. When firearms are available, people commit suicide more regularly and more successfully than people without access to firearms. A 2009 meta-analysis on lethal means reduction as a strategy for decreasing suicide rates found that policies that influenced the firearm ownership rate had the most prominent effect on suicide rates. A 2007 paper investigated suicide rates as it related to the implementation of Austrian firearm regulations. The legislation mandated safe storage practices, a 3-day waiting period for firearms, background and psychological testing prior to purchase, and that all purchasers be at least 21 years of age. The study found a statistically significant decline in suicides for women age 20 to 64, and among men in all age brackets above 20. A 2006 paper published by Dr. Miller and colleagues at the Harvard School of Public Health explored changes in household firearm ownership in the United States over the period 1981-2002 as it related to a decline in the suicide rate, controlling for age, unemployment, per capita alcohol consumption, and socioeconomic status. The study found that, for every 10% decline in the household firearm ownership rate, firearm suicides decreased by 4.2%, and total suicides dropped by 2.5%. The decline in suicide rates was highest among children, and there was no statistically significant increase in the fraction of suicides committed with other weapons. From Inj Prev. 2006 June; 12(3): 178–182. A 2000 paper by Ludwig and Cook estimated whether declines in suicides over the period 1985-1997 were associated with the passage of the Brady Handgun Violence Prevention Act. The study found that the legislation produced a significant reduction in suicide rates among persons aged 55 or older, suggesting that suicidal impulses in older individuals were attenuated by the imposition of the five day waiting period. Note also that the largest study done to assess mental health trends in the United States found that there was no significant changes in suicidal tendencies between 1990 and 2000. The number of suicides occurring during that period, however, did increase. The only explanation for this incongruity is that suicide attempts became increasingly more ‘successful’ as the years progressed, and the most accepted explanation for why this is the case is due to increase access to firearms. Furthermore, the best empirical evidence on suicides suggests that most attempts occur during temporary bouts of mental illness. One in four teens who survive a suicide attempt say that they thought of suicide just five minutes before the attempt. The presence of a gun increases the likelihood that a suicide will be ‘successful’, which is why gun regulation consistently decreases suicide rates. The imposition of waiting periods or barriers to the acquisition of a gun allows for the resolution of transient suicidal impulses, decreasing the overall suicide rate. This is further validated by a 2012 study, which shows that the majority of suicide attempts were impulsive and that restricting access to highly lethal methods of suicides (like guns) saves lives. In the case of suicides, then, the evidence is clear that guns do kill people. A key observation noted by Hedeboe and his colleagues is that injuries are inflicted by whatever object is most near. However, when a gun is available, impromptu arguments escalate quickly, leading to a lethal injury. FBI data from 1981, for example, found that 2/3rds of deaths involving arguments were a result of guns. These deaths would have been replaced by non-fatal injuries had the guns not been present. In another study, David Hemenway found that unintentional firearm deaths in the U.S. are five times higher than any other high-income country. Among the 23 countries compared, 87% of all firearm deaths of children under the age of 15 occurred in America. 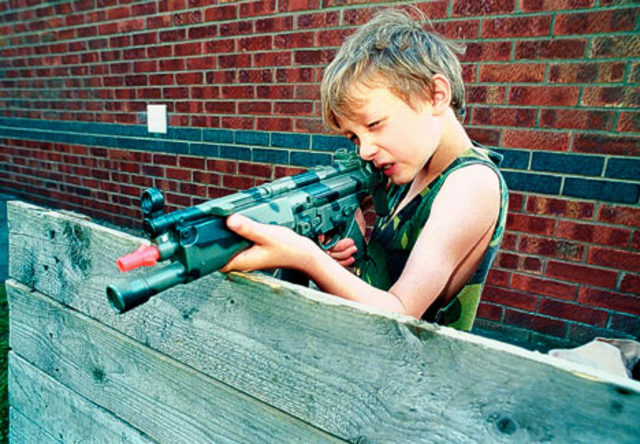 In 1995, 5285 U.S. children were killed by a firearm, compared with 57 in Germany and 0 in Japan. The risk of accidental firearm deaths is also not shared equally among the population: in low-income areas, the likelihood of unintentional injury is 10 times higher than in high-income areas. Rates are particularly high among Native Americans, White teenagers, and African Americans age 15-34. Remember, these are accidental firearm deaths, and they happen far more often than accidental deaths from any other weapon. According to the most recent data from the Centers for Disease Control (CDC), in 2010, 606 people were killed by unintentional firearm injuries. By contrast, the next highest category for unintentional deaths by weapon was knives (or other sharp objects) which killed 105 people in 2010. Despite the fact that there are many more knives in the United States than guns, guns are responsible for five times as many accidents. The reason being, of course, that accidents caused by guns are more lethal than accidents by any other weapon. In the case of unintentional injury, then, the evidence is clear that guns do kill people. A number of ecological studies in the United States demonstrate the strong association between gun availability and higher rates of homicide and suicide. A famous study entitled a “Tale of Two Cities” showed that Vancouver and Seattle, two cities with similar demographic characteristics, and near identical rates of robbery and burglary, differed in their approach to handgun restriction. Seattle, which had far less restrictive gun control laws, had a homicide rate that was 60% higher than that of Vancouver, and virtually all of the difference in homicide rates could be explained by differences in the firearm ownership rate. Furthermore, despite the fact that assault rates in both cities was very similar, the lethality of the assaults occurring in Seattle were substantially higher due to the fact that firearms were used seven-times more often. A 1986 study found that, for every time a gun was used in self-defense in a home, there were 1.3 accidental deaths, 4.6 criminal homicides, and 37 suicides involving a firearm. Therefore, a gun kept in the home is 43 times more likely to kill a member of the household, or a friend, than an actual intruder. A 1993 study compared various risk factors for homicide in three U.S. counties. They found that the presence of a firearm in the house makes it three times more likely that someone will be murdered by an intimate partner or a family member (usually during arguments). A follow-up study conducted in 2004, came to the same conclusions: if you have a gun in your home, you’re more likely to die from homicide in your home than people without guns. Guns don’t kill people, but it turns out that if you have one near you when an argument escalates, the likelihood that you’ll be killed by that gun is higher than if the weapon had been anything else. Oh, and if you’re wondering why many of these studies occur before 1996, you can thank the NRA. In the case of homicides, then, the evidence is clear that guns do kill people. ‘Priming’ is a well-known, rigorously evaluated concept in cognitive science by which exposure to an unconscious stimulus influences response to a later stimulus. A textbook example by Bargh, Chen, and Burrows (1996) involves an experiment in which subjects were primed with words related to elderly people (slow, forgetful, wrinkle), and found that subjects in the treatment group walked more slowly out of the room than subjects in a control group. These priming effects have been shown to be long-lasting as well. One study found that people primed with certain words are more likely to use those same words to complete a ‘word-fragment completion test’ long after those words had been consciously forgotten. Why is this relevant to guns? Because a group of social psychologists decided to test whether weapons could function as primes, and the extent to which such primes influenced behavior. They published their findings in a famous paper entitled “Does the Gun Pull the Trigger?” where they found that the mere presence of a weapon primes aggressive behavior. Guns in particular, due to their semantic association with violent behavior, which is reinforced through common experiences in movies, television, and front-page stories, are linked closely with aggression-related concepts. Several studies have confirmed this point. One found people exposed to weapon-related words such as “gun” or “firearm” are more likely to express hostility in subsequent time intervals than those exposed to neutral words. In the case of human psychology, then, the evidence is clear that guns do kill people. Let’s examine two graphs, adapted from the most recent available survey of international crime statistics. We see here that, compared to other OECD countries, the United States has a fairly modest violent crime rate (ignoring, for a moment, the differences in how countries report crimes). In the case of violent crime, then, the evidence is clear that guns do kill people. In the final analysis, I’m reminded of another argument made by gun advocates to succinctly challenge all gun legislation: “Gun control doesn’t work because criminals don’t follow laws.’ I pointed out in an earlier post, that the problem with this argument is that, when iterated out to its logical extreme, it necessitates having no laws at all. We would be forced to live in anarchy if the only laws on the books were ones that everybody always followed. The same is true for the “guns don’t kill people, people kill people” argument. Yes, the ultimate cause of any crime is the underlying biochemistry that regulates human decision-making. But this says nothing about how proximate causes, such as firearms, influence said decision-making, or whether or not we should regulate such proximate causes. Let us not split hairs: the purpose of a firearm is to kill—to kill at a distance, to kill with speed, to kill with maximum lethality. This is a weapon that has been optimized to extinguish life with the minimum amount of effort possible. And, for whatever reason, America has embraced a social norm that explicitly legitimizes these deaths by providing an unending laundry list of excuses whenever one happens: it was the irresponsible parents, the inadequate firearm training, the bad public policy, and so on. But it’s never the gun. And yet, somehow, the U.S. is responsible for 80% of all firearm deaths, 86% of all female firearm deaths, and 87% of all child firearm deaths in the developed world. It’s just a coincidence that we have the highest per capita gun ownership rate in the world. That’s a lot of irresponsible parents.